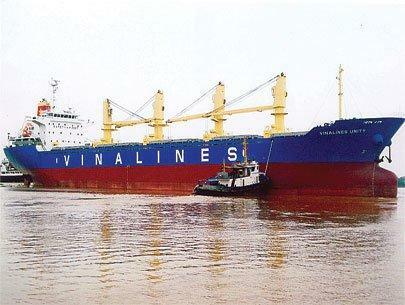 Vietnamese police have arrested five more officials in connection with a probe into state-owned shipping firm Vinalines, official media said Thursday, as the scandal swirling around the debt-mired company intensifies. The five, who were arrested Wednesday and include a former top accountant at the group, are under investigation for “deliberate wrongdoings” causing losses of nearly $5 million, Lao Dong newspaper said. All but two of 13 people under investigation were in police custody, Lao Dong reported. There is also an international search warrant out for the group’s former chairman Duong Chi Dung, 55, after police failed to arrest him in May. Inspectors said Vinalines wasted an estimated $1 billion buying more than 70 decrepit vessels which incurred huge expenses for repair and maintenance. The growing Vinalines scandal follows last year’s sensational trial of top executives at state-run shipbuilder Vinashin, which nearly collapsed in 2010 under a mountain of debt. Several officials of Vinashin were given lengthy jail terms for intentionally violating state regulations. Vinalines was handed some of the loss-making sea transport projects from scandal-tainted Vinashin, but has mismanaged them. State-owned enterprises (SOEs), many of which are widely regarded as badly managed, are a pillar of Vietnam’s economy, controlling two-thirds of capital and assets and enjoy cosy relations with officials. The government this month announced new plans to restructure the SOE sector by 2015, although experts have questioned how the scheme will work in practice. Shipping line Vinalines once symbolized the postwar promise of Vietnam when it began jockeying for global trade after the United States lifted sanctions on its former enemy in 1994. Today, it represents all that has gone wrong since then: a bloated behemoth with 18,000 workers, a fleet of loss-making ships and $2.1 billion in debt. In recent weeks, two senior executives have been arrested, its former chairman is on the run, and the firm has become a byword for mismanagement. Vinalines and other debt-ridden state companies are turning into a big test of the government’s graft-fighting credentials and whether Communist-run Vietnam is likelier to reclaim its status as a star among emerging markets or sink deeper into an economic malaise rooted in a state sector plagued by red ink and cronyism. “These companies have operated in secrecy for too long but that must come to an end,” said Jonathan Pincus, dean of the Fulbright Economics Teaching Program in Ho Chi Minh City and a former Vietnam economic specialist at the United Nations. It adds to a catalogue of problems that have overshadowed Vietnam’s promise – bureaucracy, creaking infrastructure, a debilitating trade deficit and, until recently, spiraling inflation and a stumbling currency. State firms have come under growing scrutiny since the government revealed on June 12 that debt at Vietnam National Shipping Lines, or Vinalines, was 43.1 trillion dong ($2.1 billion) at the end of 2011, more than four times its equity of 9.41 trillion dong. That drew comparisons with the near-collapse two years ago of state shipbuilder Vinashin, whose $4.5 billion debt triggered concerns over the health of Vietnam’s banks. Vinashin was eventually bailed out, but nine of its executives were sent to jail in March, convicted of mismanaging state resources. Vinalines’ executives fear the same fate. Four have been arrested since February and an international warrant is out for former chairman Duong Chi Dung, accused of deliberately mismanaging the company from 2005 to February this year. Dung, 55, rose through Vinalines’ ranks even as it hemorrhaged money. He was appointed head of the Transport Ministry’s Maritime Administration weeks before investigators uncovered wrongdoing at the company. Before joining Vinalines, he managed a loss-making waterway construction company. Vietnam had hoped to model its state firms on South Korea’s expansion-hungry conglomerates, or chaebol. But as it did at Vinashin, the idea went badly awry at Vinalines, founded in 1995 through a merger of more than two dozen companies, a year after the United States lifted its trade embargo. According to a government inspectors’ report, Vietnam’s largest state-owned shipper and port operator had losses or “irregular expenses” at several of its 14 port projects. Management of its 154 ships, mostly cargo vessels and oil tankers, appeared haphazard. Five were detained in foreign ports as a result of major financial disputes, the report said. Among the blunders was the purchase of a 43-year-old, Japanese-built floating dock from a Singapore firm for $9 million. Repair work raised the cost to $26.3 million, about 70 percent of the price of a new dock. The unused dock is now mocked in Vietnam’s press as an “iron heap”, symbolic of Vinalines’ losses. The company also built three ship repair facilities between 2007-2010 that were not included in a government-approved development plan. It spent 22.85 trillion dong ($1.09 billion) between 2005 and 2010 on 73 second-hand ships, including 17 described in an official report as “too old”, according to state media. And it lost 434 billion dong ($21 million) in 2011 because of lax corporate management and “protracted wrongdoings in business management”, the government report said. Private companies in Vietnam face high borrowing costs and double-digit interest rates, but credit is cheap for state firms such as Vinalines, which received cash injections from the state budget, soft loans from the Vietnam Development Bank for new vessels, privileges in paying corporate tax and a guarantee from the government in order to access overseas loans. Those findings, detailed in the inspectors’ report, could strengthen criticism of a controversial policy that puts a third of the economy under the control of state-owned companies to ensure a tight government grip on strategic industries. Economists have urged the government to reduce the role of big state groups and give more help to small and medium-sized firms, but they have been disappointed. Instead of closing or selling Vinalines and Vinashin, both are being restructured. Prime Minister Nguyen Tan Dung said on June 15 Vinalines would streamline its operations to focus on three businesses: maritime transportation, seaports, and services. Old and inefficient vessels would be sold to cut losses and shipping subsidiaries would be partly privatized. It has been told to cut holdings in joint-venture ports, in line with a broader government push to have state firms divest non-core businesses by 2015 and speed up partial privatization. Less clear is how the government will tighten corporate governance, an issue many regard as crucial for imposing financial discipline on an economy that retains a heavy dose of Soviet-style central planning. Maintaining the status quo could be dangerous for Vietnam. Vinashin’s bad debts have already battered some of its banks, forcing Hanoi Building Bank, or Habubank, into a planned merger with Saigon-Hanoi Bank this year. Officially, Vietnam’s bad debts stood at 108.6 trillion dong ($5.2 billion) at the end of April – about 4.14 percent of total loans, according to central bank data. Unofficially, the non-performing loan ratio is believed to be two to three times that. Fitch Ratings has said the ratio could be as high as 13 percent. Habubank put its bad debt at 16 percent of loans as of February. As of September 2011, Vietnam’s 12 largest state-run groups had combined debt of 218.7 trillion dong ($10.5 billion), 8.76 percent of the banking system’s total loans, according to the Vietnam Economic Times. There are some positive signs at Vinalines: of 9.3 trillion dong ($444 million)of short-term loans and 33.83 trillion dong ($1.6 billion)of long-term debt, only about 207 billion dong ($9.9 million) was “behind schedule”, the government said. Vinalines is also a victim of a global shipping market that has yet to recover from the mauling it suffered during the 2008 global financial crisis, which triggered what the International Monetary Fund called the “Great Trade Collapse”. Industry experts believe the industry will remain in a major phase of consolidation until late next year. Still, many expect other problems will emerge in Vietnam’s state sector, and the ratio of non-performing loans will only go up. “The poor performance of major state groups will increase non-performing loans in the banking system,” said Alan Pham, chief economist of fund management firm VinaCapital, which oversees $1.6 billion in assets. Authorities are trying to head that off. The government told state enterprises this month to put quarterly and annual financial reports on their websites or face fines – a rule many see as spurred on by problems at Vinalines and Vinashin. “The recent findings in cases such as Vinashin, Vinalines – and there might be others to follow – have a good side, in that Vietnam is aiming at more transparency,” said Nguyen Chi Trung, a director at Ho Chi Minh City-based Rong Viet Securities.